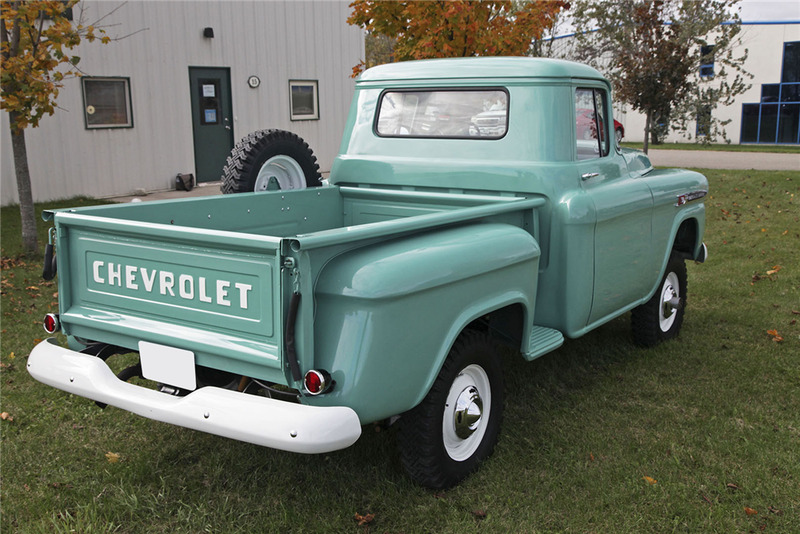 This 1959 Chevrolet Apache 31 stepside pickup has undergone a complete frame-off restoration and was factory-optioned with a Napco 4x4 conversion. The exterior features Galway Green paint on a solid body, and the wood bed is in good condition. It rides on 6-bolt steel wheels fitted with a set of unused Power King Super Traction tires. The hubcaps are correct, featuring cutouts for the front manual locking hubs. The interior features an aqua-and-white patterned bench seat, and the fittings and gauges are in good condition. The fuel tank cover, jack and tool kit are all included. This truck is equipped with a correct, unmodified 235ci Thriftmaster straight-6 engine backed by a 4-speed manual transmission. The factory single-barrel carburetor is mounted to a stock intake manifold and fitted with a correct oil-bath air cleaner. The Napco tag is visible above on the transfer case. The underside of the truck is clean, straight and free of rust. The frame, side rails, gussets and supports are all coated in black, and the cab mounts are solid. The suspension is standard in the front and rear with leaf springs, stabilizer bar and tubular shocks. From the top to the bottom, this truck is clean, with only a few small nicks and minor scratches.